Today we had lunch (Okinawa Soba and Juushii) at a famous cafeteria called Kishimoto. Its 4 days since I arrived in Sesoko. After the power came back on yesterday, I was able to continue the experiments. It would be pitiful if I left Sesoko with no data, after spending such a long period of time here. The typhoon is gone, the power is back, and weather is nice. 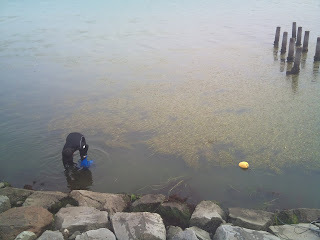 So, on short-notice, we went to get some Thalassia hemprichii and Halodule uninervis. 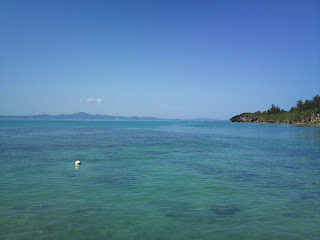 The site we went to is called Bise and just north of the Churaumi Aquarium. 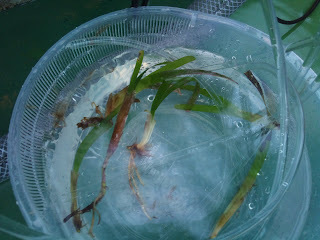 The MS students in Dr. K's lab was nice enough to collect the samples. I should have brought my gear, but since I didn't plan to go sampling, I left everything in Nagasaki. What a wasted opportunity, since the water was 23 degrees C!! It is 5:20 pm (May 28) and we just entered the high wind zone (I need to figure out the right terminology for this). This morning, the winds were blowing but things are still ok. Since this morning, I have been checking on the experiment and talking with Dr. K about stats and modeling. Tonight, we will enter the winds are expected to increase, so we decided to go out to get lunch and buy some food, just in case. This is because the Sesoko Bridge that connects the island to the main island is closed during high winds. 沖縄にいくたびに雨や風がまっている。W田先生といくときも天気がわるい。いやですね。Every time I go to Okinawa, I bring the rain and wind. Every time I go with Dr. W, the weather is always terrible. So annoying. 今回は琉球大学の瀬底島にある熱帯生物圏研究センターにいった。今週末はK原さんと一緒にリュウキュウスガモが高濃度のCO２環境下における光合成の応答を調べます。うまくいくといいですね。 So I am at the University of the Ryukyus Center for Tropical Biosphere Research Center. This weekend I am supposed to examine how the photosynthesis of Thalassia hemprichii will respond under a High CO2 environment. Hope things will work out. 台風2後は現在台湾より南。明日の夕方には強風行きに入る予定。強風行きにはいると、実験塔にいけなくなるので、正午までには実験を一旦修了しないといけない。天気が悪いので、使えるデータがとれるかどうかが一番の心配だ。 Anyways, at this time, the second typhoon of the season is just south of Taiwan. By tomorrow evening, we should be in the high wind zone. This means that we will not be able to go to the Laboratory Building. So, this means that we got to finish up the experiment before noon or so. Since the weather is so bad, I am not sure we are going to get the data that we were expecting. 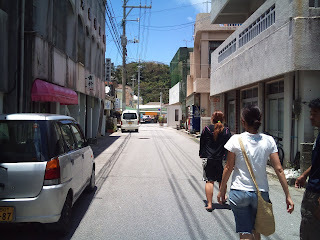 Let me show you a few photos of Omura Bay. So twice a month we survey both Katakami Bay and Tsumizu Bay, for a total of 17 stations. It is a lot of work, but twice the fun! Winter is going to be a problem. The "Great Omura Bay Survey" has finally started. Since this field work is for Mr. Kimura's thesis, he's trying his best to keep up. Yesterday, we surveyed 5 stations in Tumizu Bay (SE section of Omura Bay), and there was quite a lot of seagrass and sargassum beds to be seen.